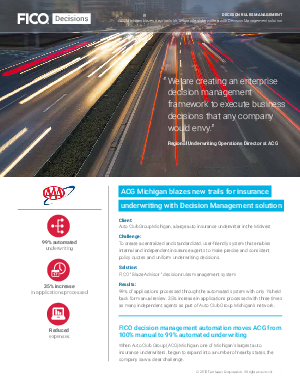 ACG Michigan determined it needed to not only standardize underwriting processes for its own agents, but also to expand business with independent agents. To accomplish this, ACG Michigan’s development team wanted to integrate three different rate quoting systems, built across two separate processing systems. The company decided to keep its mainframe system as the central information hub. However, having agents — both internal and external — across seven states who were directly processing insurance underwriting and comparative quotes on a mainframe system was a process that was too manual, too slow moving and not competitively effective. 99% of applications processed through the automated system with only 1% heldback for manual review. 35% increase in applications processed with three times as many independent agents as part of Auto Club Group Michigan’s network.